The SOLWEIG Analyzer plugin can be used to make basic analysis of model results generated by the SOLWEIG plugin. The directory where results from a previous model run in SOLWEIG is located. POIs available Here, a list of all available POI files are listed. Specify one of the POIs. If no variable is available, then no data if found in the Model output folder. Add another POI / variable Tick this in to add another variable in the plot. Variable to visualize Select a listed variable to process. If no variable is available, then no data if found in the Model output folder. Show animation This produces a time-related animation of the selected variable scaled based on the settings to the left in the GUI. Exclude building pixels Tick this in to exclude building pixels using a building grid generated from the SOLWEIG run. The building grid must have the same extent and pixel resolution as the generated output maps in the model output folder. Diurnal average Tick this in to include all grids for the selected variable to derive a pixelwise average. Daytime average Tick this in to include all daytime grids for the selected variable to derive a pixelwise average. Nightime average Tick this in to include all nighttime grids for the selected variable to derive a pixelwise average. Maximum Tick this in to get the pixelwise maximum for the selected variable. Minimum Tick this in to get the pixelwise minimum for the selected variable. Average of specific time of day The average of the selected time of day for the variable selected is generated. If ‘Not Specified’ is highlighted, no grid will be generated. 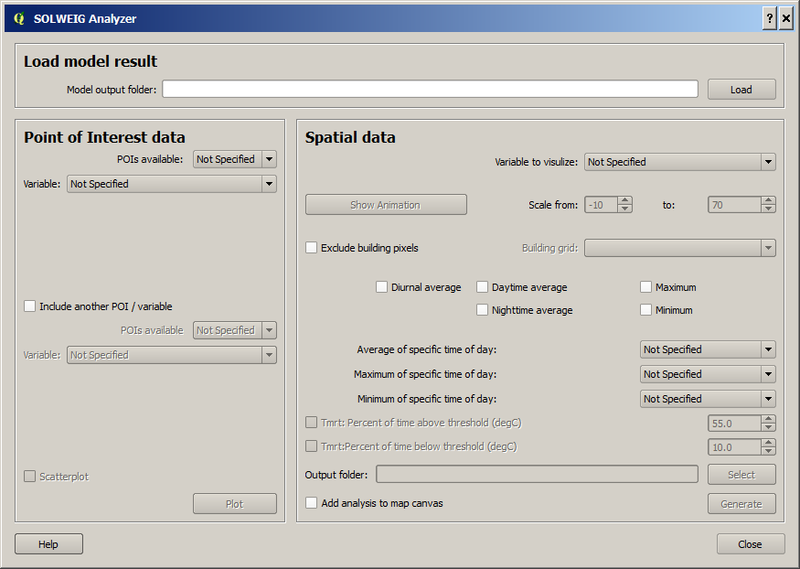 Maximum of specific time of day The maximum of the selected time of day for the variable selected is generated. If ‘Not Specified’ is highlighted, no grid will be generated. Minimum of specific time of day The minimum of the selected time of day for the variable selected is generated. If ‘Not Specified’ is highlighted, no grid will be generated. Tmrt: Percent of time above threshold (degC) If Tmrt is the selected variable, this box become active and calculates the percent of time that Tmrt for each is above the threshold specified to the right. Tmrt: Percent of time below threshold (degC) If Tmrt is the selected variable, this box become active and calculates the percent of time that Tmrt for each is below the threshold specified to the right. Output folder Directory where the results specified above will be saved.